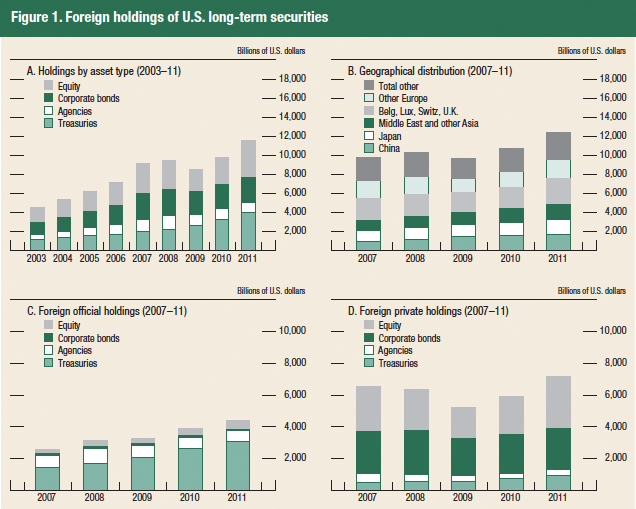 Figure 1, panel A, shows foreign holdings of U.S. securities by asset type for the years 2003 to 2011.Most foreign holdings of U.S. securities are in debt (almost 70 percent as of June 2011), especially in long-term debt. Treasury securities and corporate bonds are the two largest categories of debt that foreigners hold. The share of long-term Treasury securities in total foreign holdings of U.S. securities has increased from about 20 percent in 2007 to more than 30 percent in 2011, mainly due to investment of substantial foreign exchange accumulations by foreign official investors. Foreign official investors are the largest foreign investors in U.S. Treasury securities; their share in total foreign holdings of U.S. long-term Treasury securities has grown from 62 percent in June 2002 to 77 percent in June 2011. Short-term debt holdings (not shown) have been small, generally less than 10 percent of total foreign holdings since 2002. Figure 1, panel B, reports the geographic distribution of foreign holdings of U.S. securities. holder, and the third-largest holder of U.S. long-term securities overall. The large volume of holdings in this group of countries highlights the main pitfall in the liabilities survey— “custodial bias.” The country attribution of foreign holdings of U.S. securities as reported in the liabilities surveys is imperfect because many foreign owners entrust the safekeeping of their securities to institutions that are neither in the United States nor in the owner’s country of residence. For example, a German investor may buy a U.S. security and place it in the custody of a Swiss bank. In the surveys of foreign holdings of U.S. securities, such a holding typically is recorded against Switzerland rather than Germany. This custodial bias contributes to the large recorded foreign holdings of U.S. securities in major financial centers, such as Belgium, Luxembourg, Switzerland, the United Kingdom, and the Caribbean banking centers. The large holdings of U.S. securities by entities in offshore financial centers—especially those in the Caribbean—pose additional obstacles to interpreting foreign investors’ cross-border financial activity because these holdings largely reflect the securities portfolios of the numerous investment funds that have been established in such offshore locations rather than the portfolio preferences of residents of those countries.Moreover, because many financial institutions have affiliated banking and nonbanking offices in these offshore locations, analyzing securities transactions through these centers can be difficult without knowing whether offsetting transactions are occurring through other parts of the financial accounts. For example, when entities located in financial centers buy U.S. securities from U.S. broker–dealers, those transactions are recorded as financial inflows to the United States. However, such transactions could well be offset by equally sizable net outflows to the same financial centers but reported in other parts of the financial accounts, such as the TIC banking data. Foreign official and private investors have very different portfolios of U.S. long-term securities, as seen in panels C and D of figure 1. Foreign official holdings of U.S. securities are dominated by Treasury securities and U.S. agency securities, which together account for about 85 percent of such holdings. In contrast, foreign private investors’ holdings of U.S. long-term securities are dominated by equity and corporate bonds, each of which account for about 40 percent of such holdings. This entry was posted in Assets on May 29, 2012 by Phoenix Investor Relations.